You may have already heard the news: Google is killing off Hangouts on Air in September. A few months ago, I made a big deal out of announcing support for Hangouts on Air in RSVPMaker and using it for my own live events. That work wasn’t actually wasted, and “killing” in that headline is a little misleading, but the instructions I shared for setting up these events will be obsolete soon when the Google+ version of Hangouts on Air goes away on September 12. Google’s new answer for basically the same thing is YouTube Live, which you can set up to work almost exactly the same as a G+ Hangout. In fact, the YouTube creator UI still makes some references to Quick setup (using Google Hangouts on Air) as a label for the technology, but YouTube Live is now the favored branding. The biggest difference from my point of view is that the Hangouts Q&A tool is going away. That was one of the features closely tied to a Google+ identity. In most respects, this change is a positive because there’s no longer a need to explain to people why they need to get a Google+ account just to post a question in your webinar. However, the question is what to use instead. Google’s announcement said something about using a Q&A tool in Google Slides. You can post questions in the comments section of that blog post before, during, or after the event, and I will try to answer them “on air.” If you would like to be invited into the on air event, contact me with an explanation of what you could contribute to the discussion. Just remember that if you want to ask questions, please post them via the blog. 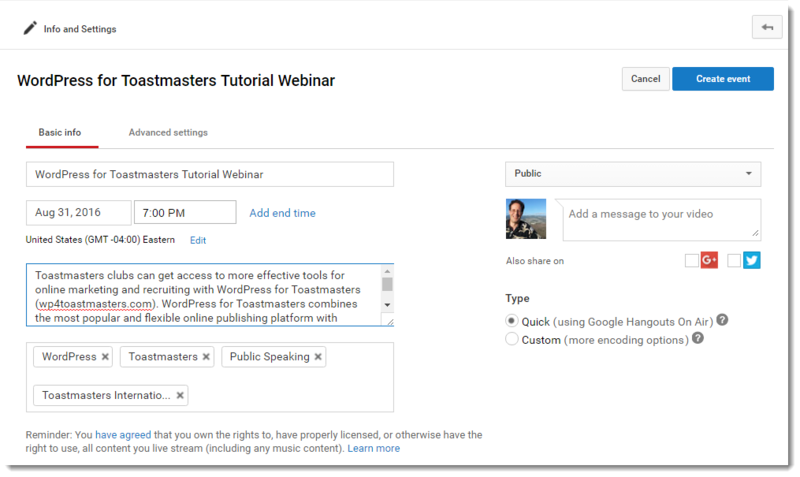 I followed the WPBeginner tutorial on adding Facebook Comments to the WordPress for Toastmasters website. Previously, I was using Disqus on that site (as I do on RSVPMaker) but engagement has been so low I thought it was time to turn that off and try something new anyway. I will report back here with more prescriptive instructions once I’ve seen how this works.